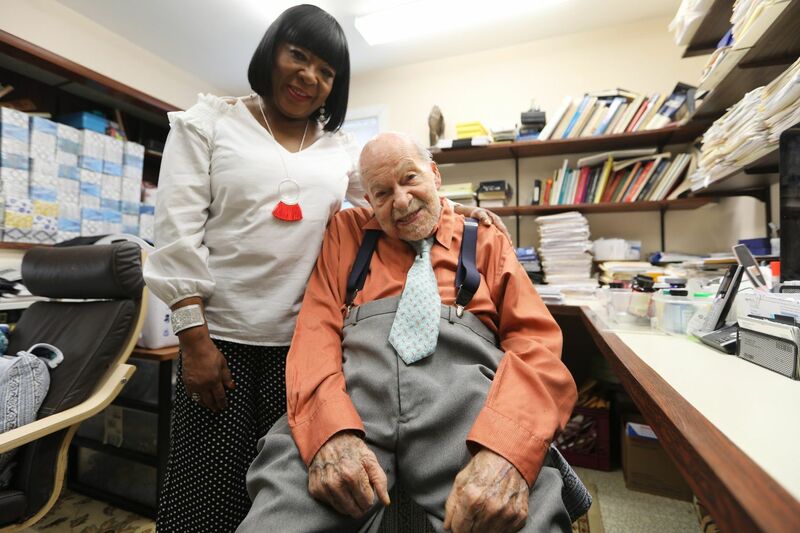 Dr. Robert Libby, shown at his Bala Cynwyd home with his caregiver, Cheryl Pringle, found fame when he invented an amazing hearing aid. He's half-deaf and partly blind, but there's nothing wrong with his mind, and the chatty optometrist is laying a trap. "What is your secret of longevity?" "I just didn't die!" he says, laughing. Libby is on his recliner, holding court in his home in a quiet corner of Bala Cynwyd. He's lived there for 50 years, the last seven alone since the death of his wife, Mira, to whom he was wed for 57 years. Actually, he's not alone. His full-time caretaker, fan, and friend is Cheryl Pringle, 57, an ebullient native of Barbados who was a classmate of Libby's children, Daniel and Claire, at Rosemont's Harrington High School. Libby is happy to talk about his son, daughter-in-law Lori, and grandchildren Max and Jacob. A diagram shows the workings of the Libby Horn. Libby is famous among audiologists, such as his son. Although he was an optometrist, he invented the Libby Horn, a simple yet stunning hearing-aid improvement that was a boon to the hearing-impaired. He came up with the device, he tells me, because he enjoyed tinkering, and because many of his eye patients also had hearing problems. The Libby Horn made him rich and famous, and brought invitations to lecture overseas. "I loved it. It was exciting," he says. "I have been to every continent except Africa and Antarctica." Libby's parents were natives of the Russian-ruled Ukraine region, and the story of Alter, his father, is novel-worthy. Alter was a Jew and a socialist, which was not unusual in the old country in the late 19th century. Also not unusual was for the czars to kill or imprison squawky Jews. A bookbinder by trade, Alter was imprisoned, escaped, and fled to Argentina, where he found work as a gaucho. A Ukrainian Jewish gaucho. When Alter "became tired of riding horses," says Libby, he immigrated to Philadelphia, where he met and married Clara Cooperman. They rented a house in Strawberry Mansion, populated by Jews who had bootstrapped themselves from enclaves in South and West Philly. Libby was born Eliah Libshitz, and when he hung out his first shingle as an optometrist in an office above the Tower Theater in Upper Darby, customers stayed away in droves. It was 1943 and he figured his name was too foreign for the suburban community. When he changed it to Dr. E. Robert Libby, patients flocked in. After seven years, he moved to a larger, ground-floor location at 6796 Market St., where he worked for the next 56 years. Libby's success came long after Strawberry Mansion, where his family lived above their Liberty Hats store at 29th and Gordon Streets. "My father and mother were very poor," he says. "Their lives were very insecure." The family's only luxury was a Philco radio that they rented for 25 cents a week. While attending Overbrook High School, Libby sold peanuts and programs at the old Robin Hood Dell. He got into the former Pennsylvania State Optometry College in Fern Rock with the help of a scholarship. He worked the night shift at the old 30th Street Post Office for 75 cents an hour, and also chopped roots off celery at an A&P processing plant. That was before success touched him, before he checked off everything on his bucket list. "I'm at peace," the optometrist tells me. Maybe you shouldn't ask a 98-year-old man about the future, but Libby is very forward-looking. "It's a little unsettled because of who is president," he says. "But I'm always an optimist." The optometrist is an optimist. I know a good close when I hear it.